At ENFL we know the importance of the right learning environment. We understand that some people prefer to study in a group where they can learn off the questions of the other people in the class, where they can learn though collective thinking and studying. We also understand that others prefer a private class where the teacher’s attention is focused on just that student. That is why offer both Private and group classes. The beauty of private classes is they are 1-on-1, meaning that a class can start when a student wants where a student wants. The benefits of this are each class can be specifically tailored to a student. If that student needs help with their pronunciation, than the class can focus of that, if the student wants to learn about the Chinese stock market than the class could focus on that. If the student wants to learn Chinese in order to go shopping, the class, if time allows, can be hosted in a supermarket. We also offer classes with a determined number of students. For Example, if we know that there are three students that want to study together for one month, if they all pay together for that one month of classes we will not add students to that class; it is their class. This way you are sure to study only with the people that you want to study with. 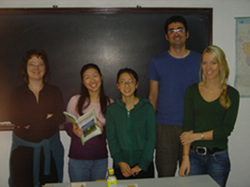 With a group such as this the students can decide what to study in specific detail, just like a private class, meaning if the group needs help with their pronunciation, than the class can focus of that, if the group wants to learn about the Chinese stock market than the class could focus on that. If the group wants to learn Chinese in order to go shopping, the class, if time allows, can be hosted in a supermarket. This class option is perfect for someone that wants to make new friends while studying Chinese. How this class works is a student is placed into an already existing class or a brand new class is formed at the level of that student and other students that are interested. The class is an inexpensive way to get an amazing education. Students should not fear that a class might have too many students, that your class might lose the personal feel; our undetermined number group class is limited from 2-6 people. This way, even within a group, everyone gets a chance to practice and gets individual attention at the same time.